In my 4 years of experience being a top loan agent for car collateral loan with multiple companies in the Philippines, we occasionally get clients from different perspective or status and career in life. In case you didn’t know it, some of them cannot qualify to apply even if they have a collateral to use to get cash. For example, I have this client who wants to use his taxi as collateral with only the ORCR to pawn as collateral but the problem is he and his wife are both in the military. The husband, a retired military officer and his wife, an active and serving military officer too. These types of clients and situations is what lenders usually avoid. It’s part of their lending company policy and I need not explain why but if you really want to know, then contact me below. With lending companies in the Philippines, for some reason, they try to avoid people from this type of job or position in the society. It’s for the lender’s prerogative therefore if they want to render cash loan in exchange for using the taxi as or car as collateral thru a car collateral loan program. This is called as car loan without taking car or sometimes the ORCR loan. The only problem is as i’ve mentioned earlier, lenders don’t allow people from the military to get approved of this type of loan. Worry not, I have a few ways I know out of the long years of expertise in dealing with different client problems who want to get a credit line. I will be revealing a few tips that might help you if you are one of those who are in this dire need to get cash but is in this specific situation. If you have source of income other than for being a military officer, then you can use that income as your capacity to pay for the loan to get approved of your car loan or taxi collateral loan application. 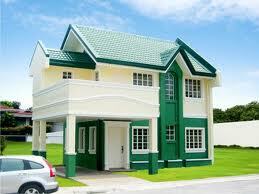 Income sources can come in different forms and one of them is apart from a regular job can be a property for lease. Another source of income can be a business. The third one can be money remittance from anybody from within family circle sending your monthly cash either thru bank, money remittance centers or via online money transfers. Apply with loan agents who know or have a provider who are private financiers. 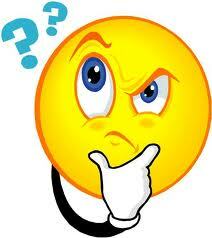 Just in case you didn’t know it, private financiers are different from private lending companies. They are usually those who have the investment money that it takes to accept collateral loans like a car loan but does not require you to fall under jobs of types of borrowers that lending companies and banks usually decline for business policy reasons. If you think this is what you need, then you have a friend and that’s me, you can contact me through my contact us page below. Go for car impounding loan. 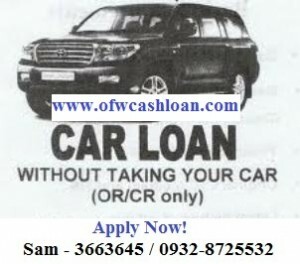 This is a last resort type of car collateral loan offered in the Philippines. The reason is because with this type, you cannot get a hold and use your car unless you have it fully paid. Lenders will take your keys, car and the original ORCR of your auto. The only advantage with this type of loan is that you can get a hold of your cash in about 1-3 hours only and requires very minimal documents to qualify. You only need your keys, car, original ORCR and latest electric or water bill as proof of residence for credit investigation or C.I. purposes. The downside on the other hand is that you completely loose the right to use your auto until full payment is done. Casino financiers. These types of lenders are also called loan sharks here in the Philippines. Car collateral loan for these people is a like a breeze. As long as they get a hold of your car and your keys, they sometimes even don’t car if it is still under mortgage with other banks or lending companies. I’ve had a client who became a victim of these types of lenders. Now that I have revealed some tips on how to get approved of your car loan application with just about any lending company including banks in the Philippines, you must be ready to apply by now. If you are, then there is no reason why you shouldn’t make that move to contact me below. I offer free consultation and assistance to all qualified borrowers so I can help you maximize your loan application approval. If you are looking for other collateral to use, these tips also apply to those who want to use their real estate property as collateral to get cash loan. Hi. I need a loan of 70K pesos. Can you help me.